I sliced it as thin as possible so that it will be crunchy and I make sure the oil is hot before dropping them into the wok and fry them till golden brown. Drain on a paper towel before serving . You can eat it with any dippings of spicy nature. I dipped it with Thai Chili Sauce. 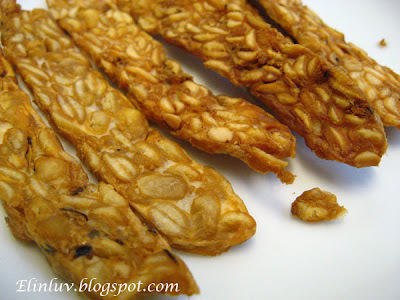 The tempeh has a slight nutty flavor...I thought it has a stinky fragrant but nope it has a pleasant taste ,infact, the more you eat the more addicted you become! 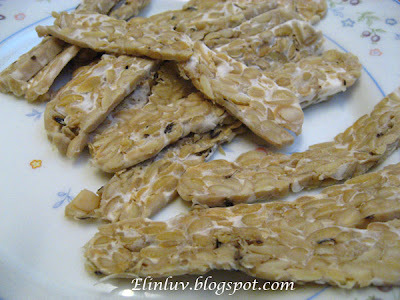 Slice the tempeh as thin as possible. Sprinkle salt on the tempeh. Heat oil and when ready ,deep fry the tempeh till golden brown. Drain it on paper towel. Haven't tried it before bcos I am not a fan of deep-frying. But your tempeh really looks so tempting that I can resist a bite!!!! 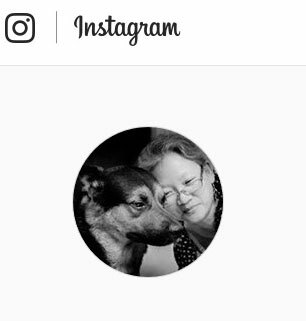 Happy Thanksgiving to your family n you too! I love tempe. I will fried it and then cook with some sambal and sometime I do eat it straight up after frying. 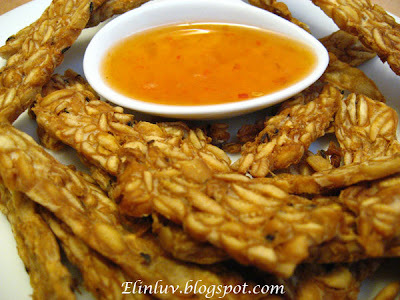 We love tempeh, shall try your easy method of using Thai Chilli Sauce as dipping.